We hope you find the following mindfulness resources interesting. We have tried to focus on articles which give useful, usable information and tips on mindfulness. There are a few links to material positioned elsewhere on this website but mainly these articles are ones that we have found in our own research on the subject. We would like to encourage you to link/share this page. An excellent talk about mindfulness which is well worth the 1 hour 21 minutes it takes to watch. Fascinating article by Jeremy Hunter PhD and Michael Chaskalson MA about the importance of becoming a better leader and the ways in which mindfulness can help this process. Leaders often have additional pressures to face but part of their role is facing these pressures calmly and having a sense of perspective. Leaders need to be present and aware to be effective, they need to be able to respond to situations with a fresh eye, not limited by their habituated actions. An important area mentioned is the difference between external and internal encoders. People who are more mindful tend to read the environment more accurately and are less subject to the potential distortion of internal biases (i.e they are better at external encoding). This report begins with a review of the research on workplace applications of mindfulness, including a section entitled ‘The potential of mindfulness for organisation ‘change readiness’. It then goes on to discuss 7 case studies of different organisations and the ways in which they have introduced mindfulness to the workplace. The paper ends with a section entitled “Top tips for applying mindfulness for strategic change”. Be Mindful is part of the Mental Health Foundation, which is working to create a world with better mental health for all. ‘We are placing mindfulness at the heart of our work in prevention and self-management.’ The Be Mindful (on-line) course was created so that anyone, anywhere, can easily and effectively learn to practise mindfulness in daily life and enjoy the benefits. The ‘Center for Investigating Healthy Minds’ website includes resources to explore current research on mindfulness, compassion, and related topics. The Headspace website provides you with the opportunity to learn meditation techniques via online resources, which are also available in an app. There is an animation to illustrate how it works and the website has information about the science of mindfulness and an informative blog. Mark Williams, Professor of Clinical Psychology at the Oxford Mindfulness Centre, outlines the benefits of Mindfulness for mental wellbeing on the NHS choices website. This site features an online magazine with articles and posts about mindfulness which you can subscribe to for free. It also has a resources section with free downloadable mindfulness exercises. Mindfulness Training – The business case & links to research. Some interesting articles and videos relating to mindfulness practice and the benefits of using mindfulness at work and in life in general. Published in October 2015, this All-Party Parliamentary Group report shows the key role mindfulness can pay in health, education, business and the criminal justice system. The Mindfulnet website includes resources for finding research which are categorised by topics. It also provides information on books and classes and features an interesting ‘Mindfulness at work’ case study based on a programme of training for NHS employees. Fascinating article by an anthropologist who uses mindfulness to help still his mind in order to be open to empathic and active listening. In this article he describes an interview with a Colombian Paramilitary leader and the importance of calming his own own anxieties beforehand so as to have a productive exchange. The results of this study suggest that participation in MBSR is associated with changes in grey matter concentration in brain regions involved in learning and memory processes, emotion regulation, self-referential processing and perspective taking. 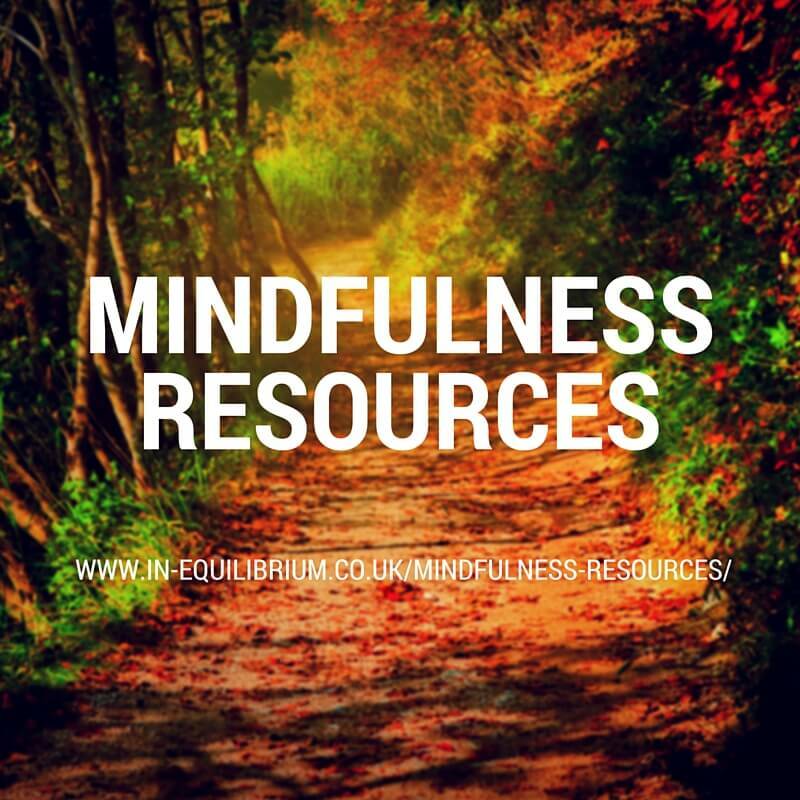 Press links, websites, books and videos all relating to mindfulness. A free online mindfulness course curated by Dave Potter which includes a collection of videos and resources to work through in your own time if you are not able to go to a face-to-face class. A raisin meditation exercise which demonstrates how we are normally quite distracted when eating. Something to watch if you want some guidance on slowing down and being focused on the action of eating. Eating mindfully! A discussion with a panel of experts (Jon Kabat-Zinn, Susan Bauer-Wo and Daniel Siegel) about mindfulness – what it does, how to do it and why it works. The trait Mindful Attention Awareness Scale (MAAS) can be found here. The document contains a detailed description of the trait MAAS, along with normative score information, including the scale and its scoring. Equilibrium Associates Limited (In Equilibrium) will not accept liability for any loss, damage or inconvenience arising as a consequence of any use of or the inability to use any information on this website. We are not responsible for claims brought by third parties arising from your use of in-equilibrium.co.uk.